And this intersection of the power of the image and the power of the material dramatically came to a head about 36 hours ago as I write. 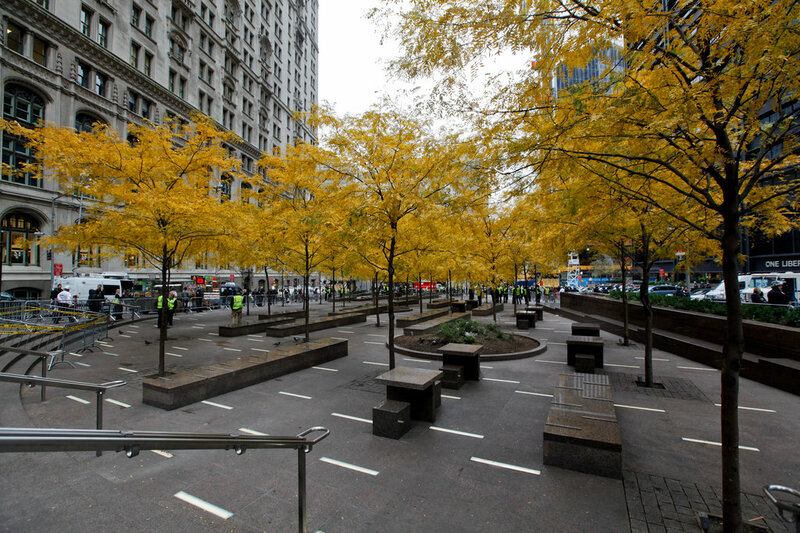 In the early morning of November 15th, the two-month long occupation of Zuccotti Park was eliminated by the City of New York. The move on the part of the city in this information-war was to create what Agamben might call a “state of exception”; one where many traditional rules do not apply. Striking by surprise late at night and arresting journalists, it is clear that the strategy behind the raid had as much to do with controlling information as it did the park and the occupiers in it. 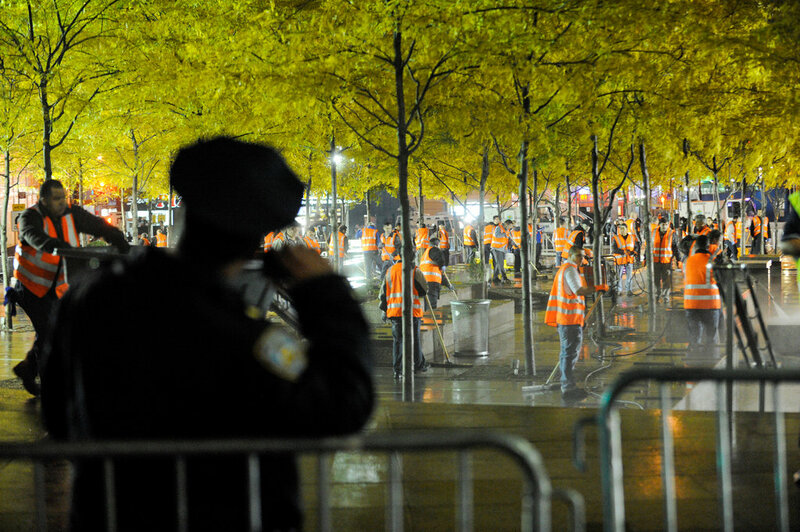 The symbolic upshot of all this will not, I think, fare well for the City or the NYPD. The unintended consequence of arresting journalists that night, of course, is that the vast majority of footage of the raid comes from the protesters themselves. The news articles above talk about a “media blackout” when, in reality, media was being produced. Photos and videos spread like wildfire when morning broke. The narrative, the symbolic framing of the event specifically and the movement in general, once again, is in the hands of the protesters themselves. Unsure how to cover the movement, much of the traditional press has largely ignored Occupy with respect to the issues at stake. However, police brutality filmed by the protesters themselves has proven to be a powerful tool to capture national attention and sympathy on behalf of the movement. The police, once again, treated the crowd as if they only existed in physical space. But the crowd took photos, livestreamed and once again took charge of the symbolism. The lasting images of the raid have massive symbolic power: hundreds of officers dressed in heavy riot-gear looking prepared to handle terrorists or a dangerous drug cartel were barreling down instead on a couple hundred unarmed peaceful campers. The draconian and seemingly hyperbolic display of force proves powerfully symbolic in further reifying the “us” versus “them” framework Occupy has so far successfully pushed. The legal battles between Occupy and various cities also land precisely at this intersection of the material and informational. The issue at hand is the legality of having or evicting mass occupations of physical space, an issue that rests on what counts as “free speech.” On the one hand, some view speech as largely informational and mostly separate from occupying physical space. Others are arguing that occupying space is itself symbolic and is itself informational speech and should be equally protected. 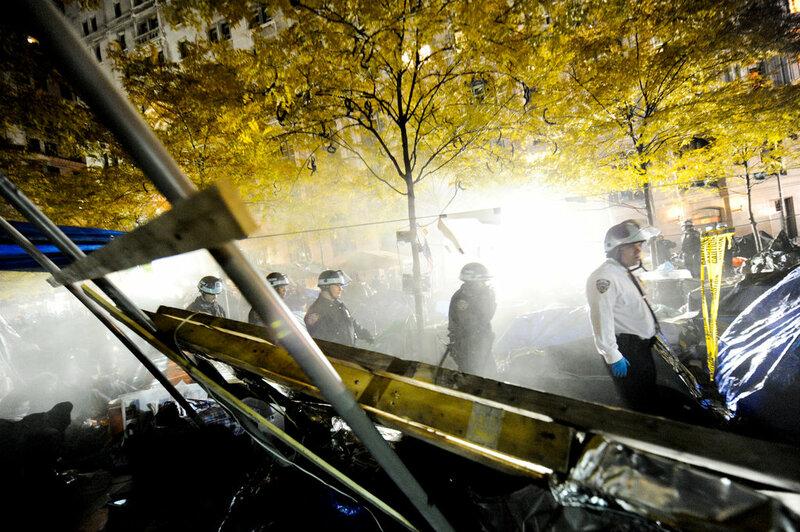 The case against Occupy is the conceptualization of the material and the informational as separate whereas the defense of Occupy believes that the two come together. Again, the case against Occupy has been to split physical space (the park) and informational space (ideas, arguments, symbols, etc). I believe these are the grounds by which legal fights and protest strategies have been and will continue to be carried out. Opposed to what Bloomberg states above, as we know, occupying parks has been part of the argument the movement has been making all along. The symbolic power of sleeping at the park was immeasurable and now the movement increasingly has to face the reality that in some ways access to physical space is becoming scarcer. Police efforts to clear Occupations across the United States continue to grow (so far, occupations have been cleared in Atlanta, Denver, New York City, Oakland, Portland, Salt Lake City, Seattle and Halifax in Canada). Thus, the Occupy movement has come to an inflection point: how can it continue to operate at both the level of the symbolic and simultaneously at the level of the physical? That double-punch has been a key to the movement’s success thus far. The movement still has the #ows hashtag on Twitter, and, as @OccupyCincy tweeted, “Even if you remove our physical bodies, we are still here; in the psyche!” However the power of a hashtag can only be understood by acknowledging how it is fundamentally anchored by the physical offline occupations where human bodies are organizing, sleeping, yelling and marching. The Occupy movement going forward cannot forfeit either physical space or informational space but must remain fixated at the intersection of the two.